Our extensive and alternative packaging options are designed to meet the needs of the clients, ranging from bulk options for industry use, to sales enhancing retail packaging. Our versatile packaging range includes safety dispensers that allow the user to dispense individual blades when required. We also offer a private branding and bespoke packaging service with advice based upon a host of factors including the client’s artwork, product, product brand, product environment/ market and the customer’s specific requirements. If you are unable to find a suitable blade from the range illustrated or require any advice on our bespoke design service please contact our experienced team for further advice and assistance. Plain industrial quality box, quantities vary due to blade design ranging from 100s - 500s ideally suited for the industrial and manufacturing sectors where superior packaging designs are not required. Quality printed box containing 20 cellophane/poly wrapped packets of 5 blades, a popular cost effective method of presenting 100 blades. Quality plain box containing 40 cellophane/ poly wrapped packets of 5 blades, an inexpensive method of presenting 200 blades. Robust plastic reusable box containing 20 Vapour Corrosion Inhibiting paper wrapped packets of 5 blades, a safe and secure method of storing and transporting 100 blades. The box has various uses when empty for storage. Quality plain white box containing 20 Vapour Corrosion Inhibiting paper wrapped packets of 5 blades, an inexpensive method of presenting 100 blades. Sturdy box containing 10 user friendly safety dispensers of 10 blades, designed to our specification this is an extremely popular and safe method of displaying, storing blades whilst reducing the risk of sharps injuries. Rigid plastic safety dispenser of 100 blades incorporates a used blade storage compartment suitable for trapezoidal utility blades and has the ability to be positioned on either your wall or workstation. This is an ideal safe packaging solution. Sturdy box containing 10 opaque rigid plastic box and lid tubes of 10 blades, an economical packaging solution. Sturdy box containing 10 user friendly hanging loop safety dispensers of 10 blades. This is an extremely popular and safe method of displaying, storing blades whilst reducing the risk of sharps injuries. Robust plastic reusable box with Euro Slot Hanging Loop containing 20 Vapour Corrosion Inhibiting paper wrapped packets of 5 blades, a safe and secure method of presenting, storing and transporting 100 blades. This box has various uses when empty for storage. Counter top display box containing either 20 or 60 Euro slot retail window blister cards of 5 or 10 blades depending on blade shape and customer preference. This is the perfect solution to promote blade sales and ideal for utilising space where it is paramount. Counter top display box containing 20 Euro slot retail blister cards of 10 snap off or non-segmental blades in a user friendly safety dispenser with hanging loop, ideal to promote products and create a point of focus. Sturdy box containing 10 plastic tubes with hanging loops of 10 blades. Designed to suit a vast range of requirements. 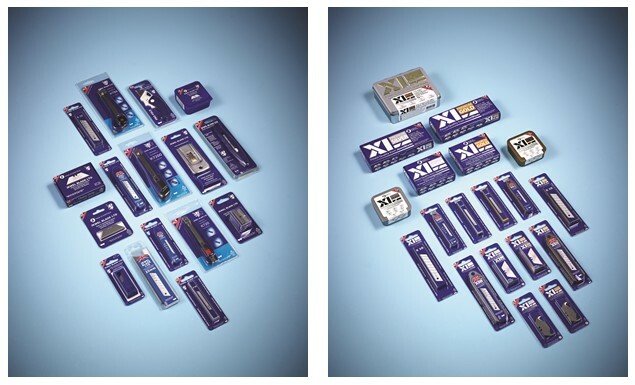 We offer a range on packaging options for our Professional Knives and Cutters from individuals for industry use to sales enhancing euro slot retail window blisters or clam sealed hanging cards. We also offer plastic euro slot hangers for any of our knives that come complete with holsters upon request.